Yikes. No easy fix there. Lajoie banged up and they may call someone up. But not Wolanin as he got hurt and will miss at least a week. wprager wrote: Lajoie banged up and they may call someone up. But not Wolanin as he got hurt and will miss at least a week. Honestly, Lajoie needed a break anyway, so it's all good. Yeah, it's slim pickings down on the farm right now. Let's give Wideman another shot. Sens just signed Justin Falk to a two way contract. He'll play Saturday. Ev wrote: Sens just signed Justin Falk to a two way contract. He'll play Saturday. Goal and an assist for Brown tonight. Chlapik scores too. Chlapik's was into an empty net. Brown tied the game at 2. That was Hogberg's first game of the season. Boedker has 1 point more than Karlsson. Sharks are out of a playoff spot. 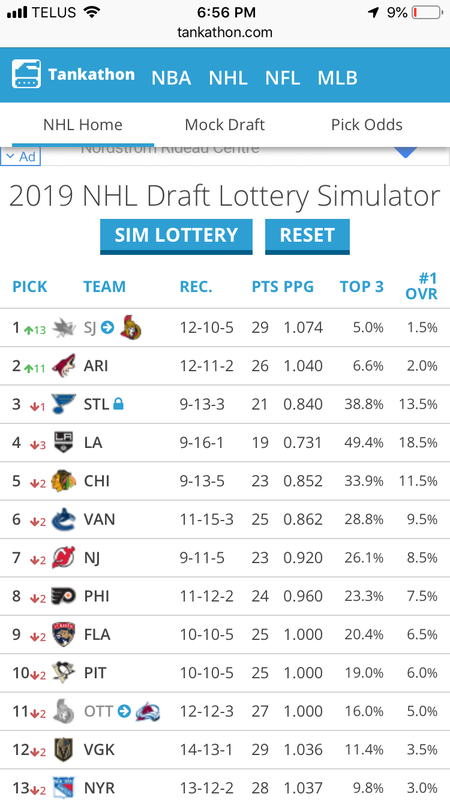 If they stay there (unlikely) the Sens will have a lottery pick. wprager wrote: Boedker has 1 point more than Karlsson. They look old and boring. Who would have thunk? Agreed. Unless the Sens are in a playoff spot he's gone at the deadline. I was just thinking that. He might actually net a first. I think there's a chance, yeah. Or a 2nd and a good prospect. 289 Re: Ottawa Senators (present and past) TIDBITS & QUICK HITS!